Choose Your Own Adventure at Pierce Country Day Camp! Eights know what they want, and Pierce listens! Eight is when Pierce campers get more input into determining their own camp activities. 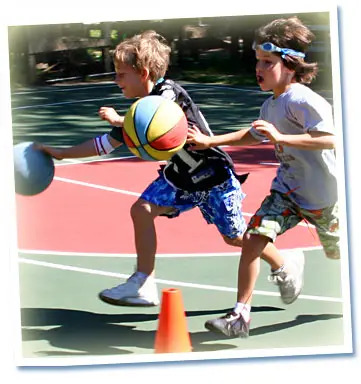 Through our "Activ8" elective program and expanded choice scheduling, campers can choose preferred activities from a tremendous range of athletic and creative possibilities. Eights also enjoy weekly League Play in soccer, basketball and baseball/softball. Now swimming in our two largest pools, Eights can participate on our Pierce Sharks Swim Team and even try the high dive! Our enthusiastic Eights have so many ways to have endless summer FUN! Choice Scheduling—twice per day our Eights get to choose between two activities. For example, Culinary Arts or Soccer…you pick! The Arts – Eights can now choose to participate in Pierce Idol and our Camp Play! These optional offerings are for Eights who want to have fun and hone their talents on the big stage! Trips Program – Once per summer on Moving Up Day, our Eights get a taste of our SCOPE Trips Program. They get to go off grounds and enjoy an activity outside of camp with their friends just like our oldest campers!